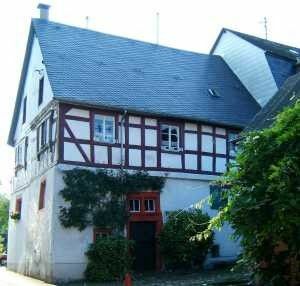 2 Bedroom cottage home in quiet wine-country village on the Mosel. Self-catering historic cottage with 2 bicycles; wine-tasting at local wineries. Enjoy the charm of a bygone era, rent our romantic cottage home in the quaint winemakers' village of Erden on the Mosel for your next holiday. Built in 1661 this half-timbered house is the oldest house in the village and is set among several registered historic half-timbered houses. It has been updated and appointed with all the comforts of home. Features include: two bedrooms, one with WC, all linens include: full-sized bathroom with shower, towels provided; down comforters and down pillows; small, functional kitchen; (Living/Dining Room) with Flat-Screen TV and Satellite feed (including English language programming); DVD and CD Player; small library, CD collection and family table games; two bicycles for guest use. Free wi-fi is available. All rooms are furnished with antiques. Self-Catering & Alternatives: A small, but serviceable kitchen is available in Haus Margarete-Erden. It includes all the utensils and small appliances you will need for fixing coffee, tea, or making light meals. You can order fresh rolls, yogurt, milk, jam, etc. which are delivered to the door every morning during your stay. Ask Olaf or Ingrid of the restaurant Zur Ratsschenke to make up your order and fax it off to the bakers in the neighboring village. Enjoy the morning as you sit in the wide sill of the kitchen window with a morning cup of coffee and watch life pass through the 'Engpass' (the Narrows) below. No need to pay until you check out. Don't feel like cooking or want to spend a romantic evening dining in? Ask Zur Ratsschenke for a list of dishes you can order from their menu for private in-home dining. Sit down to a fine meal on porcelain dinnerware and cloth napkins in the comfort of Haus Margarete's dining room. Patio table and chairs (and umbrella) available. The Middle Mosel: Erden is in the heart of the highly acclaimed Middle Mosel which stretches from Leiwen to just a bit past Erden, at Traben-Trarbach. The finest, most delicate Rieslings are produced in this fabled region. Bicycle from village to village to taste the wines at all the area wineries (check with the Tourist Information office) or just enjoy the scenery and the slow pace. Nearby Bernkastel-Kues is among the most popular spots along the Mosel with its half-timbered houses along winding streets, wine shops, wine museum and restaurants. Bernkastel is also a popular spot to start or end a Mosel boat excursion. Small refrigerator sufficient for 2-3 days of groceries. Small kitchen succicient to prepare breakfast, coffee, tea and simple meals. Not intended for cooking larger or gourmet meals. All the basic board games. Cards. Two newer bicycles just added which are appropriate for a day ride. Two older bikes for around the village. Table, chairs and umbrella can be placed in front of barn. Ask manager for assistance. We offer 10% discounts for stays longer than one week. 20% for one month stay. My husband and I stayed here with our 2 year old in October 2013, and we still consider this one of the highlights of our trip. We so often stay in uninteresting hotels, but were SO GLAD we chose to stay in a historic home in a charming, beautiful village. The restaurant down the street was excellent, and we so enjoyed getting our breakfast rolls and milk delivered to the door step! Everyone we worked with was very friendly and helpful. It was a great size - two bedrooms and a nice sized living room. And all of the beams and slanting ceilings? Well, we may ave bumped our heads a time or two, but it was part of the charm. We'd definitely stay here again, and also recommend it to others. My wife and I really enjoyed our week in this lovely house.We had good weather and it was nice to walk or cycle along the river, and there are lots of interesting places to visit.Ingrid and Olaf at "Zur Ratsschenke" are very friendly and helpful, and the food there is excellent.We intend to go back next year. Located just 8km from both Bernkastel-Kues and Traben-Trarbach and a 30 minute taxi ride from Frankfurt-Hahn (or one hour by car from Luxembourg Airport), it is in the heart of the Middle Mosel region, Germany's premier wine-country, yet away from the noisy crowds. Erden is a quiet village (pop. ca. 400) of vintners who produce the best and most distinctive Rieslings in the heart of the renowned Middle Mosel region, including Erdner Treppchen. Explore this culturally rich and beautiful region from the convenient location of Erden and start and end each day in the peace and charm of our cozy holiday home. Enjoy bicycling along the Mosel on level, dedicated bike trails to neighboring villages. Summer and fall offer the most activities: wine festivals, music festivals and outdoor activities like walking and bicycling. For a special treat, come spend Christmas on the Mosel in Germany and attend the Weihnachtsmarkt at Bernkastel. Other Activities: Wine-tasting; Mosel river cruises; castle tours; rowing.